...and 2 weeks later, your check shows up in the mail! Most Consignors make an average of $350 per sale. and check "Consignor" button to begin tagging. to pay consignor fee and select drop off time. CLICK "LOGIN" TO SIGN UP FOR SHIFTS. PLEASE NOTE: FOR THE SAFETY OF ALL, CHILDREN ARE NOT ALLOWED AT PRESALES OR DURING YOUR SHIFT TIMES. At 1:01pm remaining items are donated to charity. Sorry, no exceptions! Tag: Hole-punch JBF tag and attach it to item with ribbon or string. If item contains multiple pieces, be sure allpieces are included and list number of items on JBF tag description. Tag: If bedding is in a plastic bag, attach tag securely with packaging tape to the inside of the bag and tape the bag shut. If hung, please pin the tag securely. Books, book sets, board games, puzzles, video games, video game systems, scrapbook, arts & crafts sets are great items for resale. Please only bring kids’, parenting, homeschooling, and pregnancy books. Tag: When tagging books, please attach your tag to the book with blue painter's tape that can be removed without damaging the item. Tape tag to the outside cover of books. Hole-punch JBF tag and tie to sets. Our Fall Sale is fall & winter clothing only (what your child would wear between October-March). Be picky. Look at your clothing items as if you were going to purchase them. No stained or damaged items over 5 years old will be accepted. Please freshly clean your clothing items. Replace missing buttons, sew loose hems and seams, and clip loose threads. Please button all buttons, snap all snaps, zip all zippers before you arrive at drop off. Hang size 0-6 clothing on child-size plastic hangers and sizes 7-20 and maternity clothing on adult-size plastic hangers. Clothing that falls off the hanger onto the floor does not sell well. 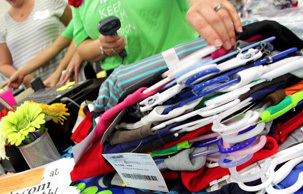 Old Navy and many outlet stores are great places to get free hangers (they throw away hangers daily!) and WalMart & Target sell child-size plastic tube hangers at a great price. - Pant-clip hangers are great but if you use a standard hanger, simply use large safety pins or your tagging gun to attach pants to the top part of the hanger so the garment will not slide. Onesies and sleepers need to be hung. Socks, tights, hats and infant mittens need to be in a clear zip-lock bag (you may group multiple items in one bag). Please be sure to label your tag well. Size 0-3 ($1-$3), Size 3-5 ($3-$5), and Size 6&up ($5-$7). Price according to brand and condition. Tag: Clothing on Hangers - Attach tag with a tagging gun or safety pin to the label of shirt or upper right front of garment. Insert the gun in a label or inside seam NOT through part of the clothing. (Items with holes from tagging guns will not be accepted). Non-Hanging Clothing - Please use tagging gun or safety pins to attach tags to onesies, socks, tights, infant mittens, and accessories. Put multiple items into clear zip-lock bags, insert tag, and tape bags closed. 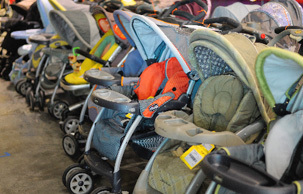 Exersaucers, swings, high chairs, changing tables, cribs (Manufactured AFTER June 28, 2011), strollers, bath seats, baby walkers, car seats(non-expired) & car seat accessories must be checked for safety recalls (link), must have all parts, and be in good condition. Children's furniture - beds (toddler, twin), desks, side tables, dressers, etc for nursery or children's rooms. Please bring Crib Waiver (link) for all cribs, and Car Seat Waiver (link) for all car seats, booster seats, and car seat bases. Price: Price 50% - 75% off retail. Items in great condition tend to sell very well. Check Amazon, EBay or Craig's list for similar prices. Price: Price low to sell. Items in great condition tend to sell very well. Make sure that shoes are clean, clean, clean! We will be VERY selective with shoes during Consignor Drop Off & Inspection. Shoes must be current season (Fall = no flip-flops, sandals, etc; Spring = no boots, etc.). Tag: Punch a hole in the top of your tag and attach the tag to the shoes with the ribbon, string, or zip tie. Ride-on toys, block sets, dolls, remote control cars, outdoor toys, learning toys, and more. All toys must be checked for safety recalls (link) before consigning. Clean all toys and baby equipment thoroughly. Please test to make sure that toys and equipment are working properly. Battery operated toys must include working batteries. Take your quality, sale-ready items to a Valet Tagger, and for a small fee, she will prep your items for you and even take them to the sale if you want! (Must drop off with Valet Tagger at least one month before the sale). • Supply fee based on supples needed. Supplies may include: hangers, safety pins, cardstock, Ziploc bags, packing tape, zip-ties, and any other supplies needed to tag and prep your items. • Please bring only your best items. Unacceptable items will be counted toward your final tally, as the Valet Tagger will be spending time on these items during the inspection process. Want to Shop Early and Earn even MORE?